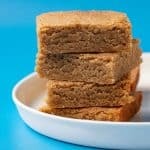 Homemade Chai Blondies filled with warm spices. Preheat your oven to 180 C (360 F). Grease and line an 8 inch square baking tray with baking or parchment paper. In a large mixing bowl, cream the butter and sugar using an electric beater until combined – be generous as this will help develop that lovely buttery caramel flavour, approximately 2-3 minutes. Add your vanilla and egg and mix again until combined. Add flour, along with all the spices and beat briefly until a soft cookie dough forms. Transfer mixture to your prepared baking tin, spreading out to make one even layer. Bake for 20-25 minutes or until a skewer inserted in the middle comes out clean. Leave in tin to cool completely.